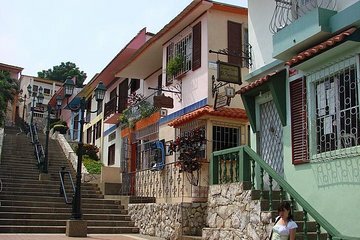 Guayaquil an der Küste Ecuadors, Heimat von zwei Millionen Guayaquileños, zählt zu den lebendigsten Städten des Landes. Erleben Sie bei dieser flexiblen Stadtrundfahrt die wichtigsten Sehenswürdigkeiten und Attraktionen der Hafenstadt und erkunden Sie den Malecón, das Viertel Las Peñas und den historischen Park. Ihr privater Reiseführer kann Ihnen Tipps geben, was Sie während Ihres restlichen Aufenthalts am besten sehen und tun können. This private tour for 4 became a group of 8 when combined with a second foursome who had booked with a separate company. The second group, whose tour was 6 hours with lunch, paid 1/2 of what we paid Viator for a 5 hour tour without lunch. Despite being given the same tour as the second group, as well as a partial refund for the difference in price, we are disappointed in this experience and will exercise caution when booking with Viator in future. In one day, we covered all of our spots Malecón 2000, Las Peñas, Cerro Santa Ana, and Mirador Cerro del Paraíso to name a few -and-we even added a ceviche stop as a bonus. Alejandro, our guide, was receptive, knowledgeable, and detail-oriented. This was a good way to get a sense of the city and to to see the Historical Park, which is a definite treat. Not only were we able to see a lot of native wildlife -- part of it is like a zoo -- but also visit the traditional village as well as other dwellings from the past. One of the main historical buildings as well as the chapel brought to the park, unfortunately, were closed for a big wedding. We also walked the Malecón, but unfortunately our guide took us in the less interesting in retrospect direction: high-rise buildings designed by a group of Miami architects, housing offices and high-end hotels, rather empty-seeming. The opposite direction is the more interesting and peopled part. Because we spent so much time at the Historical Park, we only had time to look up Las Peñas. However, both the Malecón and Las Peñas, once introduced to, can be easily visited on one's own it's worth the almost-500 steps to the top of the lighthouse, for the breezes and the view the Malecón is also especially beautiful and lively at night. We had Jaime as our driver/guide. Very polite, gentle and managed to speak English pretty well. As we went on a Monday, we weren't able to tour the historical park but we did go to a crocodile park on an island and see most of the city. Our tour guide was AMAZING and very well informed. Car clean and ride smooth which is saying something for Guayaquil!.